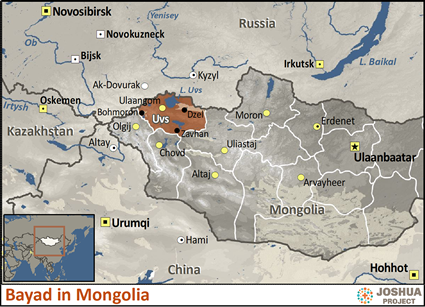 Map source: People Group Location from Mongolian Traditional Costumes. Other map data / geography from GMI. Map by Joshua Project. 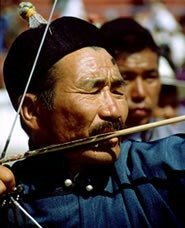 The Bayad people are one of the Mongol tribes, residing in western Mongolia. In the 13th century the term "Mongol" grew into an umbrella term for a large group of tribes united under the rule of Genghis Khan. Ethnic distinctions among the Mongol subgroups are relatively minor. Tribal differences are usually not a political or social issue as the Mongols are a generally peaceful nation. Mongolia is a very large country with limited travel facilities. Access to remote tribes requires effort. The Lord is building his church in Mongolia. Pray that believers in other Mongol tribes will carry the Gospel to the Bayad tribe. Pray for the few believers in Jesus among the Bayad community, that they will find believers in other tribes to fellowship with, and be zealous to know and follow Christ. Pray they will be a favorable testimony to their own people. Pray for the physical and material well-being of the Bayad people, that they will make schooling of their children a priority, and will be able to care adequately for their families. View Bayad in all countries.